For automotive enthusiasts and racing fanatics everywhere, Goodwood Festival of Speed surely has to be of the events on your "Bucket List." As luck would have it, Via Corsa attended the 2015 Goodwood Festival of Speed and wrote a thrilling feature on the exquisite event in our Spring 2016 issue. Beginning tomorrow the automotive spotlight again descends upon the South of England for one of the greatest events in racing lore. The Goodwood Festival of Speed (FoS) is one of those rare events held in the south of England that has managed to reach cult status in the U.S. 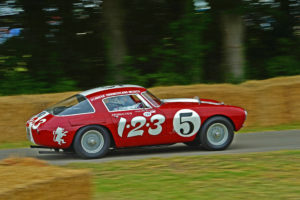 This 1953 Ferrari 250 MM throttling through the track during the 2015 Goodwood Festival of Speed. Fabulous cars such as this one will be sure to be abound everywhere this weekend in the South of England. The Goodwood Festival of Speed was founded in 1993 by Lord March. It has since become the pinnacle for English summer racing spectacles. By the summer of 2015, the event began to host over 180,000 spectators during the course of the weekend’s festivities. But what is it all about? It is a celebration of the romance of speed. Of course, plenty of fast-paced cars grace the course during the weekend, such as factory-supported Formula 1 cars, but also a plethora of not-so fast cars test the tracks as well. The event is all about reliving the thrills of a by-gone era; an era in which racing and motorsports began to find its grove and wheels. The personalities of the cars as well as the individual drivers piloting them are in fact more interesting than the times they set. Where else in the world could one possibly see the world-famous Mercedes-Benz 300 SLR #722 run up a hill piloted by the famous Sir Stirling Moss? If that is not tempting enough, imagine seeing seven of the eight remaining Mercedes-Benz 300 SLRs on the same day!